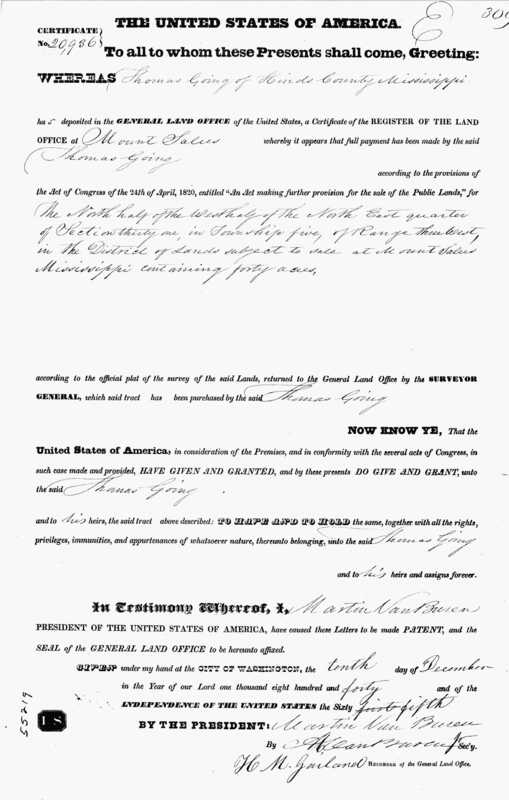 1837 April 1 – By 1837 – 1839 Drury B. Goyen appears to have moved and obtained land grants in Pickens County, Alabama – near where several Goyen (several spelling their names Goyne or Going) aunts, uncles and cousins had already settled. He and his family lives in the Pickens County, Alabama area until at least the mid 1840s. 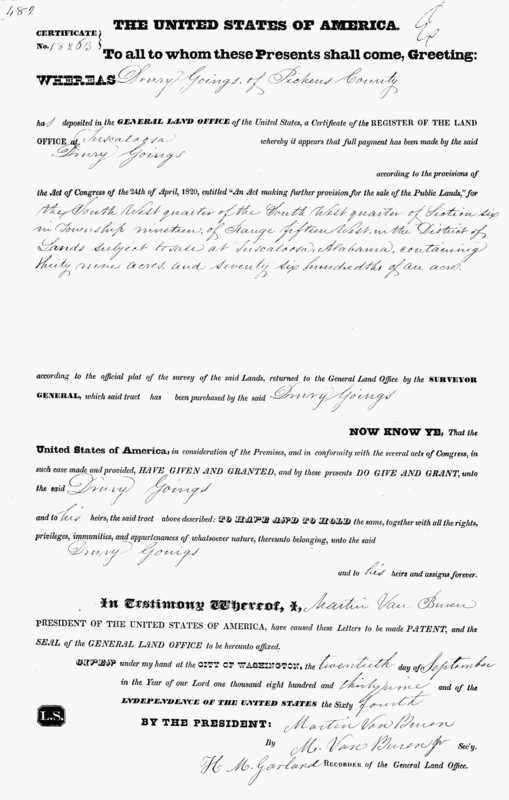 Thomas B. Goyen receives a land grant in 1840 in Alabama. 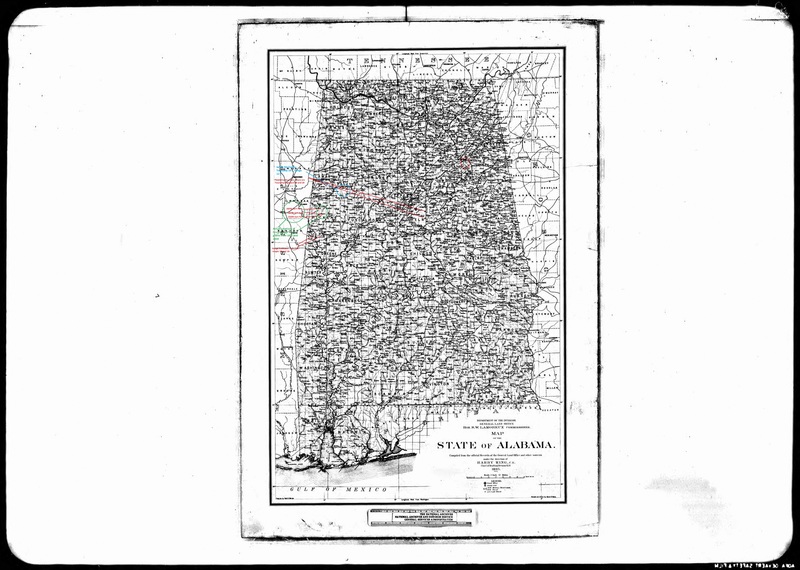 (Plat Map of Alabama with Drury B. Goyen’s 1837-1839 grants marked in Pickens County, Alabama – showing proximity to Lowndes County, Mississippi – where he appears next). 1900 Feb 16 – Geo W Going to S H Hill bk H, p 52. (More entries to 1914 – see index here: https://www.ancestry.com/interactive/8799/007651236_00220?backurl=https%3a%2f%2fsearch.ancestry.com%2fsearch%2fdb.aspx%3fdbid%3d8799%26path%3d&ssrc=&backlabel=ReturnBrowsing#?imageId=007651722_00127 ). Al Going was married to Mollie Wells December 24, 1886, according to “Pickens County, Alabama Marriages, 1881-1892.” Children born to Al Going and Mollie Wells Going are unknown. On the same day and probably in a double wedding, Lewis Going was married to Rebecca Wells December 24, 1886, according to “Pickens County, Alabama Marriages, 1881-1892.” Of Lewis Going and Rebecca Wells Going nothing more is known. W. S. Going was married to Miss S. E. Johnston April 9, 1887, according to “Pickens County, Alabama Marriages, 1881-1892.” Children born to W. S. Going and S. E. Johnston Going are unknown. W. N. Gowen, a private in Second Alabama Infantry Regi­ment and Forty-Second Alabama Infantry Regiment, was mentioned in “History of Pickens, County, Alabama,” page 36. “Rebecca Goyne” received 1/5 of the estate valued at $9,740.475, and the remainder was divided among the five children. Each child received $1,100.365 in cash and property for his share. Joseph McClure and Polly McClure, living in a non-slavery state, received cash in lieu of slaves. Rebecca Lockert Going was recorded as a charter member of Oak Grove Presbyterian Church of Franconia, Alabama on May 20, 1837. Her land lay immediately north of the church site. Later this church became the First Presbyterian Church of Aliceville, Alabama, according to “Early Churches of Alabama.” All of the 32 charter members of the congregation came from Kershaw, Union and Chester Districts of South Carolina. Rebecca Lockert Going died May 2, 1855 at the age of 79. She was buried in Franconia Cemetery in Pickens County. Mary “Polly” Going, daughter of Job Isaac Going and Rebecca Lockert Going, was born about 1809 at Flat Rock. She was brought to Tuscaloosa County, Alabama in 1823. She was married about 1830 to Joseph McClure. When her father died in 1834, they received $1,100.365 in cash. Since at that time they lived in Indiana, a “free” state, they were unable to inherit any of her father’s slaves. Martha A. Going, daughter of Job Isaac Going and Rebecca Lockert Going, was born January 25, 1811 at Flat Rock, in Chester County. She was brought by her parents to Tuscaloosa County in 1823 She was mentioned as an heir when her father’s estate was administered in 1834. She was received into Oak Grove Presbyterian Church October 1, 1838, according to the church records. She also appeared on the church roster in April 1843. She was recorded in the 1850 census at age 40, living in the household of her mother. She was married to Elder Archibald Hood May 4, 1854, according to the church records. He was born April 3, 1797, and she was his third wife. He was the tenth child of William Hood and Jane Wiggins Hood and had married first, about 1780, Annie Somerville, daughter of James Somerville and Elizabeth Fletcher Somerville. He remarried about 1831 to Mary Miller, daughter of Eli Miller and Ellen Knox Miller. He died March 25, 1871, and Martha A. Going Hood died September 30, 1873. They were buried in Franconia Cemetery. Jane E. Going, daughter of Job Isaac Going and Rebecca Lockert Going, was born July 29, 1813, probably in Chester County. She was brought to Tuscaloosa County in 1823. She was mentioned as an heir in the settlement of the estate of her father. She was married about 1837 to Benjamin J. Hughes who was born December 4, 1804. Benjamin J. Hughes died May 4, 1878, and Jane E. Going Hughes died March 26, 1880. Both were buried in Franconia Cemetery in the Going section. They had seven or eight children, according to a letter written August 11, 1947 by Walter S. Going of Birmingham, Alabama. “Evelyn Somerville, 73, died May 19, near Aliceville, Alabama at ‘Ingleside,’ home of her grandparents, Benjamin J. and Jane Going Hughes, in which pillared house she was born. Graduate of the University of Alabama, where she was a Phi Beta Kappa in 1906, she received a M.A. degree at Drexel Institute in New York City. For a generation she followed her beloved library work at Troy College and at Livingston State Teachers College. She was also a librarian at Tuscaloosa, Fayette and Birmingham, Alabama and at Columbus, Ohio. Prominent in state and local patriotic societies, she was also a leader in Presbyterian “Women of the Church” at all levels. Her only survivor is a nephew, James S. Somerville with family, except for numerous cousins. Her Revolutionary ancestors appeared in the 1790 census of Chester County, South Carolina at Lockert Shoals of the east bank of Broad River. Living there in adjoining households were Capt. James Love III [1763-1807], Drury Going and Col. Aaron Lockert who changed the spelling of his name [Lockhart] since his parents and brothers in Pennsylvania were all Tories. Eli Thomas Going, son of Job Isaac Going and Rebecca Lockert Going, was born at Flat Rock June 29, 1816. He was brought to Tuscaloosa County in 1823. He was mentioned in the Tuscaloosa County Orphans Court Book 1, page 84 as an heir in his father’s estate. He removed with his mother to Pickens County in 1835. On October 14, 1838 he was received into Oak Grove Presbyterian Church. He was baptized November 25, 1838. On January 18, 1839 he was married to Jane M. Somerville, third child of John Somerville and Sarah Hood Somerville, who was born April 5, 1815 in South Carolina. John Somerville was one of three brothers who lived in Kershaw District. He was born in South Carolina December 11, 1780 and died in Pickens County August 14, 1857, according to Mrs. Eddie R. Reed, Aliceville, Alabama who later owned John Somerville’s bible. Sarah Hood Somerville was born in South Carolina June 30, 1785 and died in Pickens County February 25, 1867. Both were buried at Oak Grove Presbyterian Church Cemetery near Aliceville. John Somerville was a brother to Hugh Somerville who was born in 1780. Both married daughters of William Hood of Beaver Creek Township, Kershaw County. William Hood left a will in Kershaw County signed October 5, 1827, according to the research of Leonard Andrea, Columbia, South Carolina. In 1842 Eli Thomas Going was a deacon at Oak Grove Presbyterian Church. He and his wife were carried on the church roll in April 1843. Eli Thomas Going and Jane M. Somerville in 1852 continued to live at Pleasant Grove. In 1868, Rev. Eli Thomas Going was shown as a visiting minister at the First Presbyterian Church at Carrollton, Alabama, some eight miles north of Aliceville. During the Civil War and for many years afterward he was a U. S. mail contractor, according to “Notable Men of Alabama” published in 1876. He appeared as a bondsman for the marriage of his son, William Samuel Going to S. E. Johnston April 19, 1887, according to Pickens County marriage records. Eli Thomas Going died at Benevola, Alabama June 28, 1889, and Jane M. Somerville Going died September 16, 1892, according to “Records of Pickens County, Alabama,” Vol. III by Mrs. C. P. McGuire, Sr. They were buried in Franconia Cemetery. Sarah Asenath “Sallie” Going, daughter of Eli Thomas Going and Jane M. Somerville Going, was born December 7, 1839 in Pickens County. She died March 21, 1863 unmarried and was buried in Franconia Cemetery. Brig. Gen. John C. Moore, CSA, wrote a report on Corp. James Alfred Going who participated in the Battle of Corinth and the Battle of Hatchie Bridge. Gen. Moore commanded Moore’s Brigade of Maury’s Division in the Battle of Holly Springs, Mississippi October 13, 1862, according to “War Department Series,”Vol. 17. He wrote, “Subject deserves special notice. He was color bearer, and though once shot down, he gallantly bore the flag through the fight on the 4th.” After he was wounded in the Battle of Corinth he participated in the Battle of Vicksburg. James Alfred Going was married about 1867 to Myrtis Billups, daughter of Col. Richard Billups and Eliza Humphries Billups of Pickens County. Col. Billups was born in 1796 in South Carolina, and his wife was born there in 1801. He was remarried January 25, 1888 to Ella Gaines Parker, daughter of Socrates Parker of Livingston, Alabama in nearby Sumter County. He was later engaged in insurance, real estate and the mercantile business in Birmingham, Alabama. He died there December 29, 1911. Richard B. Going, son of James Alfred Going and Ella Gaines Parker Going, was born April 20, 1872. First Lt. Richard B. Going served in the First Alabama Infantry Regiment during the Spanish-American War. Later he served in the Forty-fourth U.S. Infantry Regiment. His first term of military service reached from April 21, 1898 to 1903. Then He became a career officer with the U.S. Army. In 1946 Col. Richard B. Going, retired lived in Philadelphia. Elizabeth Pryor Going, daughter of James Alfred Going and Ella Gaines Parker Going, was born about 1880. She was married about 1900, husband’s name Boykin. About 1946 she lived at 3214 Cliff Road, Birmingham. Mary Sophia “Mollie” Going, daughter of Eli Thomas Going and Jane M. Somerville Going, was born December 31, 1843 in Pickens County. She was baptized July 11, 1844 at Oak Grove Presbyterian Church, according to church records. She was married about 1870 to G. W. Hughes. Mary Sophia “Mollie” Going Hughes died September 28, 1872. G. W. Hughes, who was born July 30, 1842, died November 11, 1915. Both were buried in Franconia Cemetery. Mary Going Hughes, daughter of G. W. Hughes and Mary Sophia “Mollie” Going Hughes, was September 19, 1875. She was married about 1896, husband’s name Morrow. In 1946 she lived at Tuscaloosa, Alabama. Martha Jane Going, daughter of Eli Thomas Going and Jane M. Somerville Going, was born in Pickens County January 4, 1846. She died at age two November 7, 1848 and was buried in Franconia Cemetery. John S. Going, son of Eli Thomas Going and Jane Somerville Going, was born in Pickens County April 5, 1848. He appeared on the roster of the Oak Grove Presbyterian Church between 1863 and 1873. He was married about 1871 to Nannie Wilson. He was a bondsman for the marriage of his brother, William Samuel Going to E. S. Johnston April 9, 1887, according to Pickens County marriage records. He died in Birmingham in September 1922. Howard Wilson Going, son of John S. Going and Nannie Wilson Going, was born November 14, 1884. He was married about 1907, wife’s name Rose. In 1946 they lived in Oak Park, Illinois. Augusta Going, daughter of John S. Going and Nannie Wilson Going, was born about 1895. She was married about 1918 to Paul Sherman. Evelyn Going, daughter of John S. Going and Nannie Wilson Going, was born June 6, 1889. She was married about 1910, husband’s name Webster. In 1946 she lived in Hamilton, Ontario. William Samuel Going, son of Eli Thomas Going and Jane Somerville Going, was born in Pickens County January 22, 1851. “W. S. Going” was married to Elizabeth S. Johnston April 9, 1887. Signing the marriage bond was John S. Going, Alfred Elijah Going and Eli Lockert Going, his brothers. He was an early-day member of the First Presbyterian Church of Birmingham, according to “Some Early Alabama Churches.” He died in Birmingham. Clarence Johnston Going, son of William Samuel Going and Elizabeth S. Johnston Going, was born in Birmingham January 25, 1888. He was married about 1912 to Louise Thornbury. He continued there in 1946 at 1117 S. 10th Street. Job Going, son of Eli Thomas Going and Jane M. Somerville Going, was born at Pleasant Grove November 29, 1852. A biographical sketch of him is included in”Notable Men of Alabama” by Dubose. According to the sketch, he was a name-sake of his grandfather, Job Isaac Going. He appeared on the roster of Oak Grove Presbyterian Church from 1863 to 1873. On December 9, 1880, Job Going was married to Maude Slaughter, daughter of Samuel Slaughter and Mary Slaughter of Petersburg, Tennessee. In 1882 he went to work for Drennan & Company, a mercantile firm in Birmingham. In 1890, Job Going removed to Pratt City, Alabama, later extinct, where he became a merchant and an elder in the Presbyterian church. Maude Slaughter Going died January 26, 1920, and he died in Birmingham December 2, 1927. “Job Going, 75, pioneer citizen of Birmingham, died at his residence, 1125 Louise Street, South at 7:30 a.m. Friday. He was ill two weeks, following a breakdown. Job Going was born at Pleasant Grove, Pickens County, Alabama, November 30, 1852. He came to Birmingham in 1883 and had lived here since. For years he engaged in the merchandising business in Pratt City, making many friends. He manifested an interest in the affairs of this section and was elected to the Jefferson County Board of Revenue in 1904 and was reelect for a second term, being chosen president of the board. He was an ardent worker in the position, and many developments started at that time throughout the county are to be credited to his vision. At the time of his death, he was engaged with his sons in the road machinery business, being president of Going Road Machinery Company, Inc.
Herbert Watson Going, son of Job Going and Maude Slaughter Going, was born about 1882, probably in Birmingham. He was a partner with his father in Pratt City in a mercantile business. He was married to Ruth Danahoe September 10, 1915. In 1917 they lived in Calexico, California. Walter Somerville Going, son of Job Going and Maude Slaughter Going, was born December 2 1884, probably in Birmingham. He attended Auburn College. He was married January 1, 1919 to Helen Margaret Newhall. Raymond Eli Going, son of Job Going and Maude Slaughter Going, was born August 8, 1889, probably in Birmingham. He was married about 1926 to Jessie Woodward Jones. He died September 18, 1929. No children were born to Raymond Eli Going and Jessie Woodward Jones Going. Hugh Campbell Going, son of Job Going and Maude Slaughter Going, was born September 15, 1892, probably in Birmingham. He was married July 2, 1921 to Alice B. Wheeler. He died December 23, 1929 in Birmingham. Eli Lockert Going, son of Eli Thomas Going and Jane M. Somerville Going, was born February 10, 1855 in Pickens County. He was a bondsman for the marriage of his brother, William Samuel Going April 9, 1887, according to Pickens County marriage records. He died January 31, 1922. Alfred Elijah Going, son of Job Isaac Going and Rebecca Lockert Going, was born March 4, 1819 in Chester District, South Carolina. He was brought to Tuscaloosa County, Alabama in 1823. He was mentioned as an heir in the estate of his father which was administered in 1834. His family removed to Pickens County, Alabama in 1835. He was married to Miss Marion A. Wigginton September 5, 1841 at Princeton, Kentucky, according to Caldwell County Marriage Book 2, as abstracted in “First Caldwell County, Kentucky Marriage Books.” Marriage Record Books 1-21 were transcribed by E. Arwana Kyle for the volume. Marion A. Wigginton Going was born May 25, 1818. “Marion S. Going” appeared on the roll of Oak Grove Presbyterian Church in Pickins County in 1843. He appeared on the membership roster of Oak Grove Presbyterian Church between 1853 and 1860. 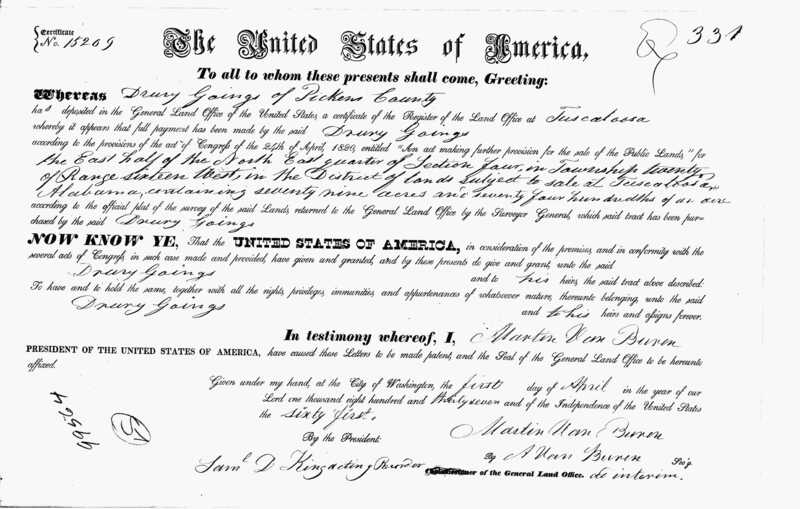 On December 16, 1854 Alfred Elijah Going received land in Section 13, Township 22, Range 14W in Pickens County. The land grant was recorded in”Tuscaloosa Land Office Register,” according to “Old Tuskaloosa Land Office Records & Military Warrants, 1821-1855” by Marilyn Davis Barefield. He became totally blind by 1857, according to a letter written February 3, 1857 by his uncle, Isaac Going of Union District. Marion A. Wigginton Going died July 6, 1881 and was buried in Franconia Cemetery, Franconia, Alabama. Alfred Elijah Going joined his brothers Eli Lockert Going and John S. Going as bondsmen on a marriage application of W. S. Going and Elizabeth S. Johnston April 9, 1887. He died February 27, 1896 and was buried beside his wife. Rebecca Jane Going, daughter of Alfred Elijah Going and Marion A. Wigginton Going, was born in 1842. She was baptized October 25, 1842, according to the records of Oak Grove Presbyterian Church. She was married about 1866 to J. W. Bridges. Mary Bell Going, daughter of Alfred Elijah Going and Marion A. Wigginton Going, was born August 29, 1844 in Pickens County. She was admitted to the Oak Grove Presbyterian Church about 1863. On December 26, 1871, she was married to E. G. Mobley who was born January 8, 1836. E. G. Mobley, who died September 28, 1896, and she was remarried about 1900, husband’s name Freeman. She died January 1, 1916 and was buried in Bethany Presbyterian Church Cemetery in Pickens County, located five miles east of Aliceville, Alabama, according to “Mississippi Cemetery and Bible Records,” Vol. 5. Susan Augusta Going, daughter of Alfred Elijah Going and Marion A. Wigginton Going, was born September 23, 1846 and was baptized as an infant April 1, 1847 at Oak Grove Presbyterian Church. She died October 18, 1851 at age five and was buried in Franconia Cemetery. John Job Going, son of Alfred Elijah Going and Marion A. Wigginton Going, was born December 25, 1848. He died at age three February 24, 1852 and was buried in Franconia Cemetery. Thomas Henry Going, son of Alfred Elijah Going and Marion A. Wigginton Going, was born January 9, 1851 in Pickens County. He died at age 16 March 22, 1867 and was buried in Franconia Cemetery. Emily Augusta Going, daughter of Alfred Elijah Going and Marion A. Wigginton Going, was born in 1855 in Pickens County. She was married about 1875 to Edward E. Rose who was born in 1855 in Greene County, Alabama. They removed to Fayette, Alabama before 1880. He later served as mayor of Fayette. She died there in 1943, and he died there in August 1953. Martha Josephine Going, daughter of Alfred Elijah Going and Marion A. Wigginton Going, was born July 29, 1859 in Pickens County. “Josephine Going” was baptized in 1860, according to the records of Oak Grove Presbyterian Church. She was married May 12, 1886 at age 26 to James K. Martin. Martha Josephine Going Martin died July 22, 1900 and was buried in Franconia Cemetery. Presbyterian Church who were descendants of the charter members of the church. Rebecca Going, daughter of Job Isaac Going and Rebecca Lockert Going, was born about 1822, probably in Chester County. It is believed that she died before 1834 because she was not mentioned as an heir in the administration of her father’s estate in that year. Mrs. Maude Going were received into the congregation were received into the congregation between 1875 and 1882. Teeny Going was received into the church September 22, 1839. William I. Going was received into the congregation between 1853 and 1860. Going Jay, Tyler Polk Jay, James Jay, Mary Jay and Lewis Jay were received into the church between 1863 and 1873.